Onyx has two built-in ways to control access to your sites. This article describes using password protection to restrict access to the entire WordPress site. This is indepenent of, and in addition to any Wordpress login your site may require. You could use a 'Maintenance Mode' plugin to prevent users seeing your site whilst it's in developement or whilst you are making changes. There are two steps to complete, firstly enabling the password protection, and then secondly creating authorised users. Changes made here (enable/disable or add/remove authorised users) can take up to 60 seconds to be live. We have a separate article on admin IP protection, which restricts access to the Wordpress Admin login/dashboard by IP address. Drop down the Settings menu and select Password Protection. Click the 'Enable Password Protection' button. Once enabled this button will change to 'Disable Password Protection'. This can be clicked to remove the password protection. 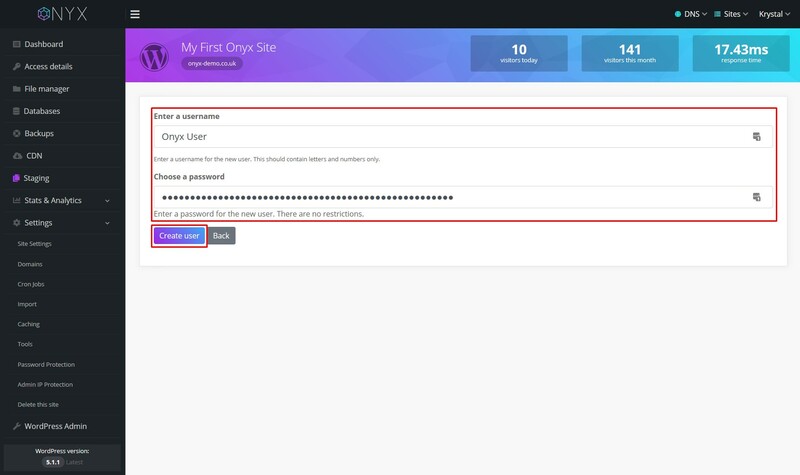 Click the 'Create an authorized user' button. 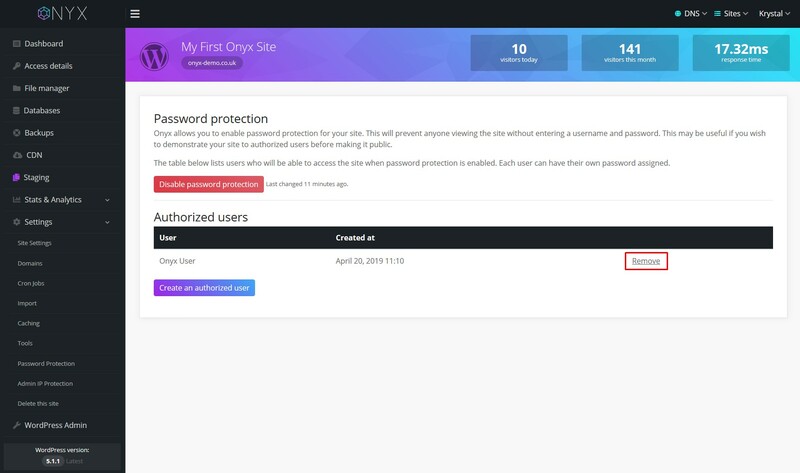 Enter a username and secure password and click the 'Create user' button. Click the 'Remove' link next to the user you'd like to remove. You will be prompted to confirm removal, click OK and the user will be removed.